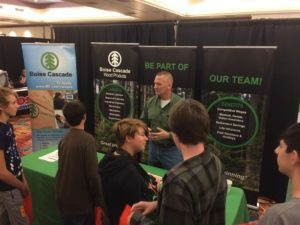 More than 60 exhibitors converged with about 800 students for the Sept. 28 Southern Oregon Trade Careers Expo, an indoor-outdoor gathering designed to introduce teens to job options in numerous skilled trades industries. Students from Douglas, Jackson and Josephine counties took school buses to Seven Feathers Casino Resort. Awaiting them in the parking lot were equipment and displays from branches of the armed forces, law enforcement, firefighting and other emergency services. Inside the convention center, teens stopped by booths featuring businesses, industries, educational programs and the military. 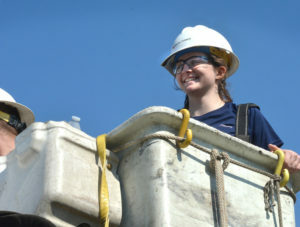 Organizers promoted the Expo as a way to introduce high school juniors and seniors to exciting careers in the trades. 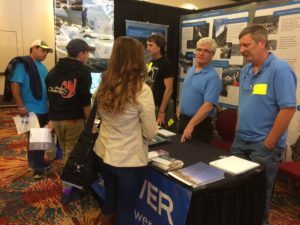 Indoor exhibitors included North River Boats, Pacific Northwest Regional Council of Carpenters, Pacific Power, Peterson CAT, Boise Cascade and TerraFirma Foundation Systems. The expo was organized and sponsored by the Cow Creek Umpqua Tribe, the Oregon Department of Transportation and Phoenix Charter School in Roseburg. Carson said a similar careers fair is held in Portland, but the distance and associated costs make it too expensive to send RHS students there. “This gives students a chance to meet some of the professionals in these fields. They can pick up brochures and get their questions answered,” she said. Days Creek Superintendent Mark Angle accompanied his seniors and juniors to the convention center. He explained that he brought both grade levels because the next expo won’t be until 2019. Angle said it’s important to present students with options aside from four-year universities. “We have taken our students to college fairs in the past, but we also need to be sure kids get a chance to find out about high-demand, high-wage jobs that don’t require college degrees. Career fairs like this one can be valuable for making connections with employers looking for skilled workers in the trades. In addition to answering students’ questions about jobs and describing qualifications needed to get those jobs, exhibitors shared their own backgrounds and asked teens about their interests. Booths were stocked with brochures, pamphlets and other field-related literature. 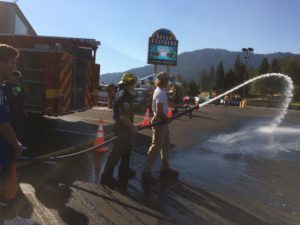 Outdoors, firefighters allowed students to suit up and direct a massive hose while emergency services personnel worked with a simulated crash scene. A set of chin-up bars tempted a few teens to test their prowess outside the Navy display. Kira Oerman, recruitment specialist with Umpqua Community College, said students stopping by the UCC booth seemed most interested in the school’s nursing program, with criminal justice courses also drawing many questions. She said she works to help area families and students understand there are many options for young people seeking to start good careers here in Douglas County. “I’d like them to know that if they aren’t sure yet what they want to do, to reach out and I can try to help them by setting up a tour or a visit with a specific department. There are so many different possibilities,” Oerman said. 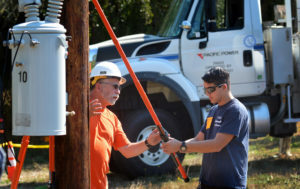 Warner said economic indicators released by the State of Oregon Employment Department show that jobs in construction and manufacturing trades are on the rise in southwest Oregon, in large part because of waves of baby boomers retiring. Young people entering the workforce may not be aware of the demand for skilled, qualified laborers, she said. Putting together employers with potential employees falls in line with the tribe’s goal to “build our communities (and) educating our youth to become responsible and productive individuals who choose to stay within the cities with which they’re familiar,” Warner said. That goal should carry forward to the 2019 expo, which is closer than it sounds. In the meantime, Douglas County Partners for Student Success and the Umpqua Valley STEAM Hub will share news and information about other opportunities for students to explore career options. These will include events such as the Feb. 7 Explore Engineering, Computer Science and Forestry at UCC, as well as the 2018 Expanding Horizons summer camps. Details will also be forthcoming on DCPSS Education to Career Mentoring programs, as well as Brightworks Career Clubs being formed at local high schools. If this is done in Douglas County again I would love to participate or connect you with the Oregon Association of Nurseries. The Days Creek area has a perfect location for growing bedding plants and other greenhouse crops.